Although I visited on a much quieter day, I could nonetheless picture the grand spectacle which visitors from 2,500 years ago might have witnessed when they paid tribute to the grandoise of Persepolis at its peak. At the entrance is the well-preserved Gate of All Nations. A few steps away, one can see the remains of the military quarters, treasury and reception halls. 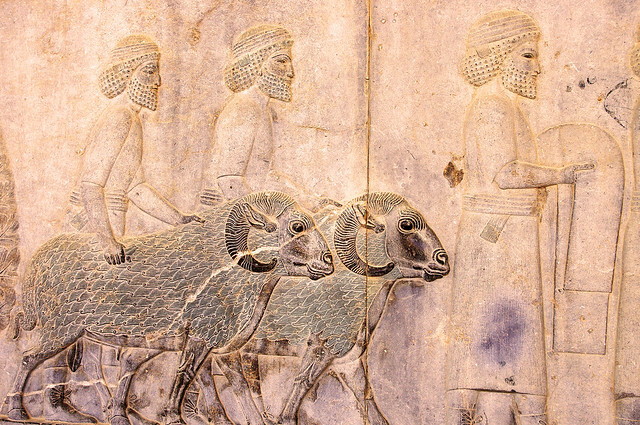 These were used by well-known Persian kings such as Darius and Xerxes. 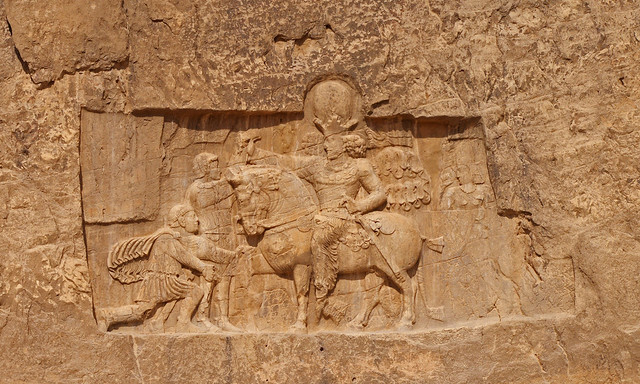 There are several areas where one can see excellently-preserved bas reliefs showcasing representatives from other nations marching to Persepolis to pay tribute to their king. Even the gifts they brought were immortalized in the carvings. 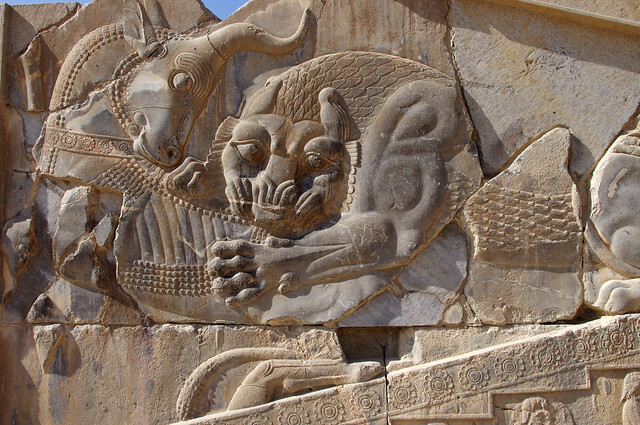 Like many other lost cities, Persepolis fell into decline due to either war or famine. 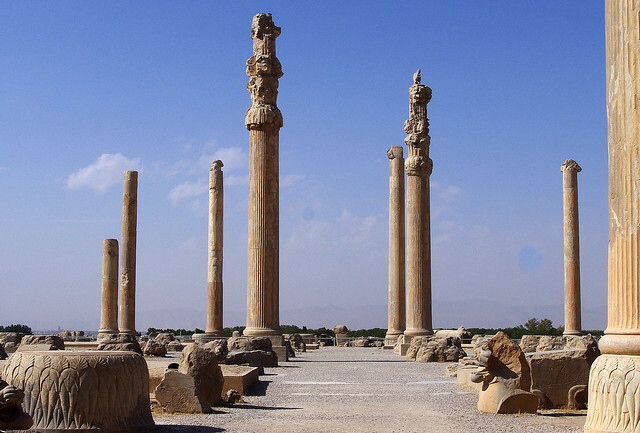 For this Persian city, it is the former, having been ransacked by the famous Alexander the Great when he invaded Persia. It was never resettled and fell into disuse. Despite this, the city was not forgotten and several excavations occurred in the 1800’s and early 1900’s. The most serious one occurred in the 1930’s by people from the University of Chicago, and this brought the lost city pretty much to its current state. 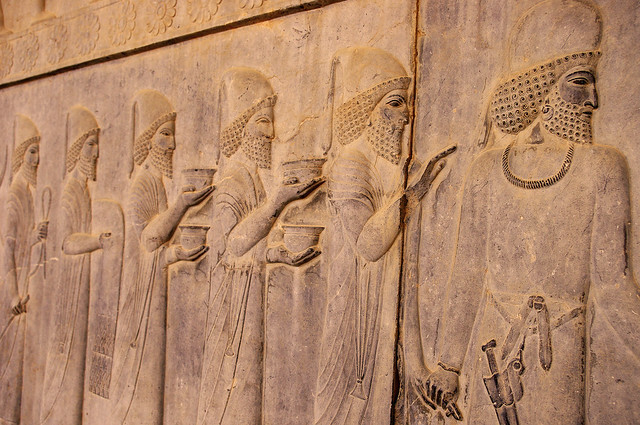 Today, Persepolis is one of the crown jewels of Persian heritage. The locals I met were fiercely proud of it, perhaps as it served to remind them of how powerful their nation used to be. And in many places I go in Iran, I saw motifs of Persepolis being represented in their modern-day architecture as well. Aside from Persepolis, our daytrip also included an excursion to the Necropolis or Nagsh-e-Rostam in Persian. 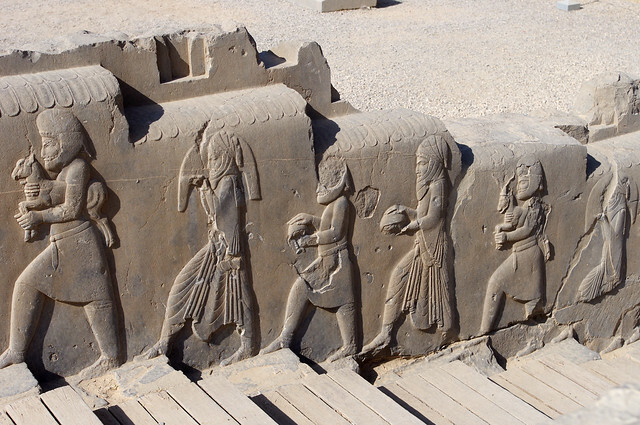 Located around 18 kilometers from Persepolis, this is the site of the tombs of the ancient kings from the Achaemenid dynasty and include many of the who’s who of ancient Persian personalities – Darius the Great, Xerxes, Artaxerxes and Darius II. The four tombs are carved on a humongous and impressive-looking rock face with a facade that is shaped like a cross. It opens into a small chamber where the actual king lay in a sarcophagus. These chambers are off-limits to tourists. Aside from the tombs, one can also see several carvings – these originate from another dynasty (Sassanid) and depict historical events from this era. The most famous and most well-preserved is one depicting the victory of the Persian king over the Roman Emperor, Valerian during the 3rd century AD. How I got there: Most convenient way of getting to Persepolis and Nagsh-e-Rostam is by joining a local tour which can be booked in Shiraz. Pars Travel Agency does this for around US$ 20 per person. It starts at around 8AM and ends at about 1PM, includes car, driver and guide. This is a great post – thank you for sharing it. Great info, great images.